Use the Quick Search and Holiday Ideas facilities on our website to find suitable accommodation for your holiday. Self catering properties and hotels give prices according to season; self catering properties also have a calendar to assist in showing latest property availability. And don't forget, we're here to help make sure you choose the right holiday for you - please do contact us if you have any queries or want to know more, about the regions we cover and the houses and hotels we offer. We always welcome the chance to talk about the Spain we know and love! To discuss specific requirements, availability, itineraries, ferry crossings and car hire, or just with a general enquiry, contact us by phone on 01223 328721 or email us at mail@casas.co.uk. Please read the sections About The Properties and The Booking Conditions before making a booking. Refundable damage deposits are required on some properties, payable with the final payment. The amounts are indicated on specific properties - see Booking Conditions. We offer a package to include return ferry crossings with Brittany Ferries and also if required can supply single journey ferry tickets. We ask that you make your ferry booking with us at the time of booking your property/hotel. But if at a later time you decide to add a ferry booking to your holiday, just phone or email us with details. For prices, contact us with your details and we'll give you a quote. We strongly recommend that all holiday makers take out personal insurance, and for those travelling long distances by car we also advise a car breakdown insurance scheme. We advise that you organise your holiday insurance at the time of making your holiday booking, to protect against cancellation. Bookings can be made following our on-line booking procedure, using the red “Book Now” button on the main accommodation page for each house or hotel. See below for details. Bookings, requests and enquiries are also welcomed by phone or email - call 01223 328721 or contact mail@casas.co.uk, and we'll discuss your requirements and take necessary information. NB 1) All online bookings are subject to availability. Your booking remains provisional until confirmed; confirmation is normally within one working day, Monday-Friday; please allow a little longer over weekends and holiday periods. We advise caution in booking travel prior to receipt of confirmation. NB 2) Start and departure dates are generally flexible, subject to availability; however bookings for self-catering properties should tie in with existing booking dates in the high and peak seasons. To complete the on-line booking form you will need a valid email address and details of all members of your party. Please note: You must include a valid email address or your booking will not be received. Once you have completed and sent the form, an acknowledgement email will be sent to the nominated email address; this confirms details of your booking request and holiday costs,and gives methods of payment. NB This email is computer-generated and it is not a confirmation of your booking. As soon as we have been able to ensure that your chosen accommodation and dates are all available for you we will email full confirmation of your booking. We aim to confirm your booking within 24 hours during weekdays, although over weekends and holiday periods this may take longer. Once you have received full confirmation please make the payment due - see details given in the original acknowledgement email. NB If you decide to pay by bank transfer or cheque, please let us know by email. We will then send you a written letter of confirmation. A deposit of 30% of the accommodation cost and 20% of ferry travel charges is due at the time of booking. Payment balances are due ten weeks before the start of the holiday. For bookings made ten weeks or less before the start of the holiday, full payments are due at the time of booking. Payment may be made by bank transfer, card or cheque; credit card payments only carry a 1.5% transaction charge. A binding contract will come into force between us, Casas Cantabricas, and you, the client, at the time we have received your payment and send you our confirmation invoice, and until then we shall be under no liability to you whatsoever. For your Financial Protection Casas Cantabricas is bonded with AITO Trust Ltd. In the event of our insolvency you, the client, will be refunded and/or repatriated. We try to be flexible wherever possible about days of arrival and departure; please ask about this when making your provisional enquiries. 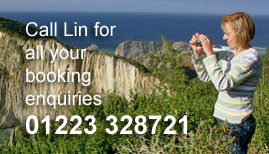 However during High and Peak seasons bookings for self-catering properties should tie in with existing booking dates. (a) Bookings which fall into two seasons are charged for accordingly. (b) Additional days over one week are charged on a pro-rata basis. (c) Short breaks - weekends and or 3-5 day bookings. are available on some properties, (details are indicated on individual property pages of the website).